In a bid to curtail the $1.6 billion Australians pay annually in credit card surcharges, starting 1st September 2016, large retailers will no longer charge excessively on credit cards. The new law, Competition and Consumer Amendment (Payment Surcharges) Act 2016, which was introduced yesterday for big retailers, and will take effect on all Australian retailers from 1st September 2017, is intended to eliminate the excessive charges Australians pay on credit and debit card expenditures. This means large businesses are only legally allowed to pass the “real cost” of a purchase made by the user’s card without including a profit margin on top. What Types of Cards Are Affected? 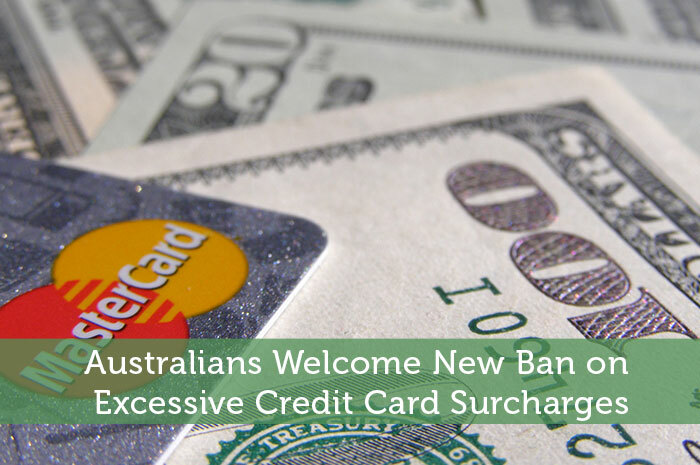 The cards involved in the surcharge ban include EFTPOS, MasterCard, Visa and American Express provided by Australian banks. Other types of payment excluded from the surcharge ban are BPAY, PayPal, Diners Club cards, and American Express cards issued straight from American Express. Finance experts believe there will be a change from fixed-fee surcharges for buying items like flight tickets to percentage-based charges. Similarly, some event ticket sales companies will modify their pricing methods so customers may no longer be charged for how they wish to pay. As a guide, the Reserve Bank of Australia (RBA) has stated that the costs to merchants for receiving payment by debit cards is 0.5%, 1.5% by credit card, and 2 – 3% for American Express cards- however, this figure may be higher for some merchants. How do you Determine a Large Business? For now, until next year, the ban is effective for only large retailers, so how large is large? Specifically, for the surcharge ban, a large business is one with any of the two factors above. As consumers continue to favour card use over cash, and contactless payment technology increases, the ability to utilise credit or debit cards without extra charges is a more favourable option for Australian shoppers. In fact, a recent study revealed 1 in 3 consumers admitted it was important to know whether they would be surcharged by a business for a purchase. Another 75% said they would advise family and friends to avoid a business that surcharged its customers. This is the reason behind groups like the consumer support collective, Surcharge Free. They believe the new law is not stringent enough and surcharges should be eliminated totally. In other research, it was concluded that the cost of surcharges was counter-productive to businesses in the long run, especially as competition continues to increase among rival businesses. It was also observed that 93% of Australians agreed all surcharges should be dropped, and more than 90% agreed that not being surcharged was a determining factor for repeat business. While the curtail of surcharge may be good news for consumers, there are other ways they can be hit by excess costs. Whether it is a high annual fee payment on their credit card or monthly bank charges for card access, it is important to understand not only retailers can bite, but card providers too. The new ban won’t stop businesses from charging “booking fees” or “service fees” which exist despite payment method. But businesses must obey the Australian Consumer Law by disclosing the details of such fees to their customers in a clear manner.